WAND Customer Service Taxonomy Released! We are proud to announce the latest entry in the WAND Taxonomy Library - the WAND Customer Service Taxonomy. Customer Service is a vital element in most businesses. It can make all the difference in the success of a company. 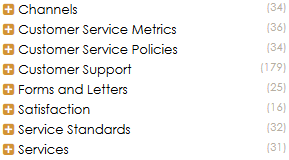 The WAND Customer Service Taxonomy provides a foundation set of 400 terms and 299 synonyms covering important area topics. You can see the top level terms in the screenshot on this blog. It's ideal as a starting point for organizing customer service content in your enterprise applications. As with all WAND Taxonomies, the WAND Customer Service Taxonomy is available by itself or as part of the larger WAND Taxonomy Library Portal.